Much is written in self help books and blogs about the effect of what is known as the lizard brain – so named because it is the part of the brain that mammals share with reptiles. The part that controls simple functions like breathing and heart beat. It is also believed to be a vital component in the experiences of fear, lust and anger. Further, this part of the brain is necessary for the reflexive learning known as classical conditioning – the sort of learning that caused Pavlov’s dogs to salivate at the sound of a bell ringing. Classical conditioning is responsible for some powerful emotional responses. This was famously shown in the 1920s in a study by John B. Watson involving a child known as Little Albert. Initially, Little Albert was allowed to play with a white rat. He displayed no fear of the rat. In the experiment that followed, Watson made loud, frightening noises whenever the child touched the rat. The result was that Little Albert became frightened every time he saw the rat. His fear didn’t stop with the rat – it extended to rabbits and even fur coats. Little Albert’s lizard brain was a key part in him being conditioned to be fearful of furry animals and objects. Clearly, reptiles only have a lizard brain and without the additional brain parts that humans have, they are unlikely to experience emotion in the same way as we do. But I think the question about whether they experience emotion remains open. The possibility exists that fear (or lust or anger!) unmodulated by a higher brain is a much more immediate emotion. It is possible that reptiles inhabit a world filled with powerful emotion. If that is the case, perhaps concern for their emotional well-being is something that needs to be considered when thinking about the best ways to care for them? I can claim no significant expertise when it comes to the behaviour and handling of reptiles. But I do have some knowledge about how their emotional well-being may be improved. I have been studying and using a training, handling and rehabilitation method known as Tellington TTouch for around eight years now. The method itself has been around for over 30 years and started as a way to work with difficult horses. Its usefulness with other animals quickly became clear. The method became widely known in the UK after Sarah Fisher trained as a practitioner and started running the UK TTouch office. Now there are TTouch practitioners covering most of the UK. TTouch encompasses a philosophy of respectful approach to animals. This means that the emotional well-being of the animal occupies a position of importance throughout any training or handling sessions. When working with reptiles, this can involve the animals being handled or stroked in different ways using hands or with a variety of tools such as feathers and paintbrushes. These can be useful as animals often respond in new ways to being touched with differing textures. When touching with hands at first, people sometimes find that using the back of their hand allows them to keep their touch light, avoids prodding and can be more easily accepted by the animal. Using TTouch also means being aware of how the animal is responding and trying to look for indications about how the animal may be feeling about what is happening. The information gained from remaining aware and watchful allows adjustments to be made about how, where and for how long the animal is touched. I’m aware that this description may make TTouch appear wishy washy and unattractive to people who need to deal with uncooperative or aggressive animals. That’s certainly how I felt when I first heard about it. At the time, I had a large dog who was hostile toward other dogs and I didn’t see how touching him gently would help change his attitude. Eventually, I bought a book on TTouch and tried out some of the suggestions. Soon after, I noticed small differences in him. So I signed up for the TTouch practitioner training program and as I went through it, my dog gradually changed until he lost his hostility and was keen to play and mix with other dogs. My first experience of working with reptiles was with a fearful frilled dragon who could not be easily handled by her person. She was brought along to one of the practitioner trainings by a man who ran a reptile sanctuary. Unlike most of the animals he brought that day, the frilled dragon was his own animal. He told us that he’d been caring for her since she was an egg – a statement that raised a few smiles around the room. As he spoke about her nerves and how he’d had to think hard about whether or not to bring her, he seemed worried. He expressed concern that the lizard would just run around the room in fear and would be unable to accept anybody close to her. When he put her down on the floor and she started to run, he immediately offered to put her away and allow us to work with some of his more easy to handle animals. 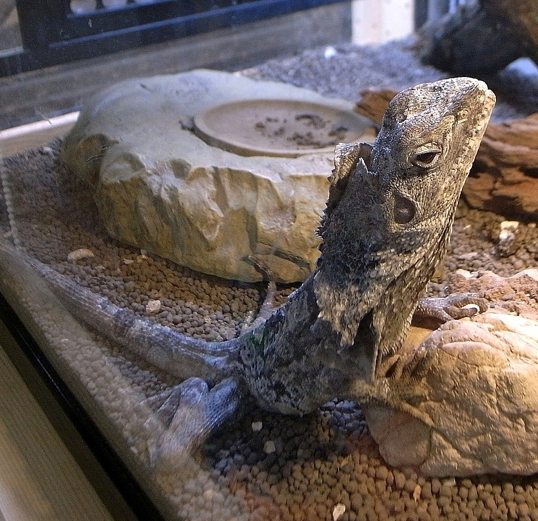 The course instructor asked him and us to just be still and wait to see what the frilled dragon would do. After some time spent running, she stopped and rested on a handbag that was lying on the floor beside where I was sitting. After a few moments, she seemed to be settled and could be stroked carefully with paintbrushes and feathers. As time passed, she became more relaxed and was able to accept being touched gently with fingertips. During this process if her muscles became tense at any time, we took it as a sign that she wasn’t happy with what was happening and would stop to give her a break. If we’d been doing something new, we’d stop and go back to doing something that she had accepted happily. Eventually, we felt that it might be more comfortable all round if the lizard was sitting on a lap rather than clinging to the side of a handbag so we asked the man who’d brought her if he thought that would be okay and how to go about lifting her. He said that he thought we should try, warned us that she might scratch a bit if she got scared and suggested that she best be lifted by a hand being slid under her belly. I sat on the chair, slid my hand under the lizard and lifted her. She immediately became tense but others were there ready to stroke her with paintbrushes and she quickly settled. Out of the corner of my eye, I noticed that her person had turned away as we lifted her and only turned back when it was clear that the move had gone well. When he did so, he rolled up his sleeve to show a wrist covered in deep scratches and said that his injuries had been sustained when he’d taken the lizard out of her enclosure to bring her to the course that morning. Happily for us, the lizard remained calm and gentle while we worked with her. When she did become restless, we called her person and he was able to lift her without issue and put her somewhere that she could rest. The next time I saw the same lizard was around six months later. That time, the man lifted her into his hand in a relaxed way, held her and talked a bit about her. Then he calmly asked if anybody wanted to work with her, said that she liked to be handled by people and would be a good animal to work with for anybody who was new to reptiles. I asked if it was the same frilled dragon as he’d brought before and he assured me that she was, saying that he had been practising what he’d seen us do on the course and had found it beneficial to her. There is further information about TTouch for reptiles under the companion animals section and a list of all members of the UK TTouch guild. Members around the country can be contacted about seeing animals on a one to one basis, doing workshops or talks.